Johannes Gutenberg University Mainz (JGU) researchers have devised a new method called single-crystal electron diffraction tomography to accurately identify the arrangement of molecules and atoms in materials ranging from pharmaceuticals to cement. Dr. Ute Kolb's research team at the Mainz University’s Institute of Physical Chemistry developed the novel method based on electron microscopy. However, the method is still in the nascent stage. By using the technique, Kolb’s research team first identified barium sulfate’s structure in 2009. 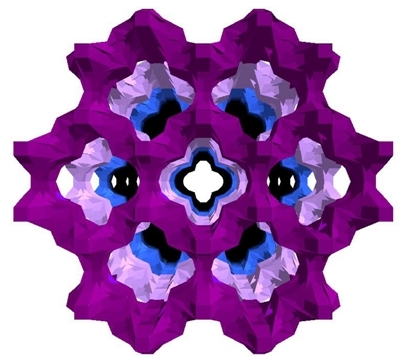 Most recently, the team in partnership with scientists from China and Spain has used the technique to determine the structure of a new kind of fine-pore zeolite ITQ-43. Kolb commented that her novel method paves way to further discoveries in the field of nanostructures. Zeolites are crystalline materials made of a compound of silicate and aluminum. They have tiny pores, which make them to be used as catalysts, ion exchangers and adsorbers for instance in the field of environmental and energy technologies. According to Kolb, automated diffraction tomography is the ideal method to view accurately the structure of crystals with size in the range of 100 nm. Her method is suitable to study a wide range of synthetic and natural solid materials, including those that cannot be produced in a proper crystal size or those that are not available, she said. By using her microscope, she studied various materials ranging from minerals such as charoite to titanate and color pigments utilized in solar technology over the last two years. The novel technique, electron diffraction tomography is comparatively quicker, highly accurate and more complete than traditional electron microscopy. This method delivers accurate results in just one day whereas previous methods used to taken even two years and is even suitable for studying beam-sensitive materials, which has been described as ‘computer tomography for crystals’ by Kolb. For further advancement of the technique, Kolb’s research team is partnering with Professor Dr. Thorsten Raasch of the Institute of Mathematics and Professor Dr. Elmar Schömer of the Institute of Computer Science at Johannes Gutenberg University Mainz.